Remember the tiny sneak peek I gave you here? Well, this is the final piece! 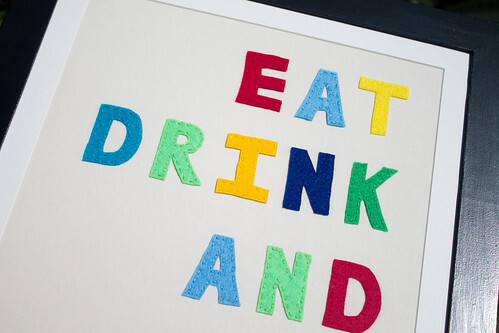 It's some felt kitchen art to hang on the wall! It was part of a gift for a kitchen themed bridal shower I helped throw for a very dear friend of mine! The inspiration came from these embroidery pieces from CASTLE that I've been lusting after for awhile now!! But without a spare $500 to spend on one of those lovelies, one is left with the thought "I could make that..." And with my friend's bridal shower coming up, I had the perfect opportunity to try it with a quote that would fit the occasion! So I drew out some letter patterns on paper, traced them onto felt, and sewed the felt letters onto a piece of fabric with three strands of the closest matching colors of embroidery floss. I then cut a mat and my dad made a frame (which has plexi-glass instead of real glass so that it wouldn't break!) that I painted black. I am very pleased with the final piece and am itching to make some more! Maybe I'll make something for my own wall! Have you been inspired to create something based on something you've seen? What's the last thing that made you think "man, I wish I came up with that idea!?" 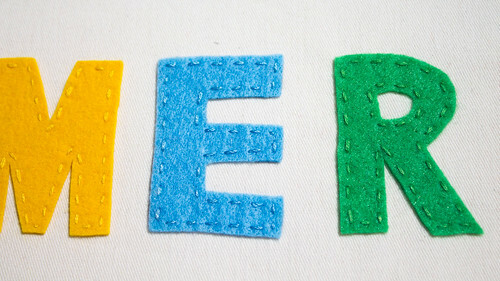 I like the hand-stitching on those colourful felt letters. 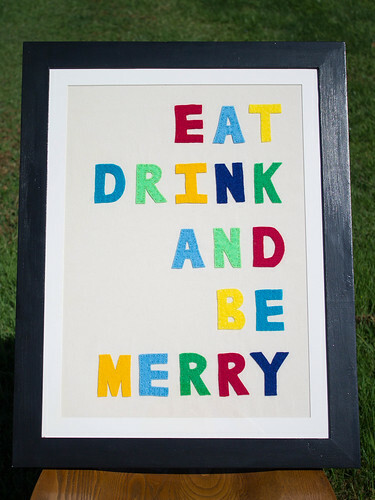 The final result is very cheerful and will brighten up your friends' kitchen and make them smile! Yes, I have sometimes got inspiration from magazines to do my own home decorations, especially when my children were small and I wanted to make them colourful decorations for their walls. Some were in felt and some in embroidery. You did a beautiful thing my dear!!!! ...about your question : I pin every day a lot, so imagine the answer.....:oD !!!! That's adorable! I love the bright colors.